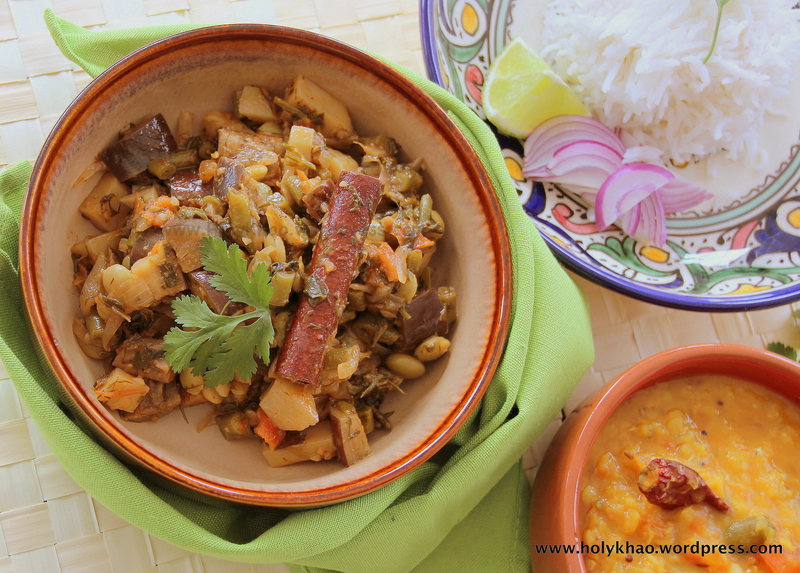 holykhao | Learning to eat better without sacrificing taste, variety & convenience. I’m sharing an easy and popular recipe for your next holiday gathering. I found the original here, and tweaked it slightly to suit my family’s tastes. This halwa can be made using grated paneer or ricotta cheese. While the ricotta gives a creamier taste, it took longer to cook. Simmer the halwa mixture for about 20-30 minutes for regular texture, and around 45 minutes for a fudge texture (which is what we love). Finely grate the paneer if you are using it. Using a wide heavy-bottom pan (preferably non-stick or anodized), bring the mango pulp, cheese and sugar to a boil on medium-high flame. Once it reaches a boil, reduce flame to medium and simmer for about 20 minutes till mixture thickens, stirring frequently and making sure it doesn’t stick to the bottom of the pan. Add the cardamom powder or rose water and the milk powder for thickness. Mix well. Cook for another 5-10 minutes and pour into a flat greased platter to cool. Alternately, continue cooking an additional 15 – 20 minutes if you like a thicker, fudge-like consistency. Then add the milk powder and flavoring, and cook for another 5-10 minutes and pour into your platter to cool. Spoon into individual bowls and top with nuts and serve. NOTE: Make sure the pan is atleast 4-5 inches deep as this mixture will splatter as it thickens and simmers. Also, DO NOT ADD sugar mid-way unless you plan on increasing the cooking time significantly (yes, I learnt this the hard way!). The sugar will dilute your mixture and you will have to cook it down again – it’s like starting from scratch. Paneer gives the halwa more texture while ricotta makes it more creamy. Millet is also gluten free, protein rich & is an excellent source of dietary fiber. While comparable to semolina in calories & carb count, millet has a lower glycemic load meaning that its high fiber & low simple sugar composition produces lower blood sugar levels than rice. Millet helps foster healthy gut bacteria, and the serotonin is calming to the mood. (all info from www.Care2.com). 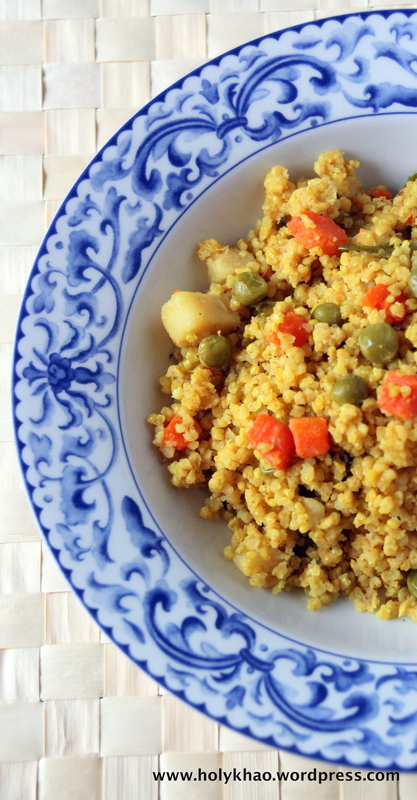 Millet looks like large quinoa, and is sometimes mistaken for it. This whole grain can be used as a healthier alternative to rice and can be cooked both savory or sweet. My friend Uma gave me this idea and given the health benefits and easy of preparation, it will definitely be a staple in my pantry. Heat a large heavy bottom pan on medium flame, and add oil. When oil heats up, add the onions, chillies and the ginger and fry till the onions start to slightly brown, stirring frequently. Add tomatoes and saute till they are soft, about 2 minutes. Add the carrots, potatoes, peas, salt & turmeric and stir fry for 3-5 minutes on medium-high flame. Immediately add the millet, stir everything well and return to boil. Reduce flame, cover and allow to simmer for about 20 minutes on low flame. Do not lift lid midway to check. Remove from heat, stir and recover; allow the millet to sit for about 10 minutes. Add the lemon juice & cilantro and stir before serving. 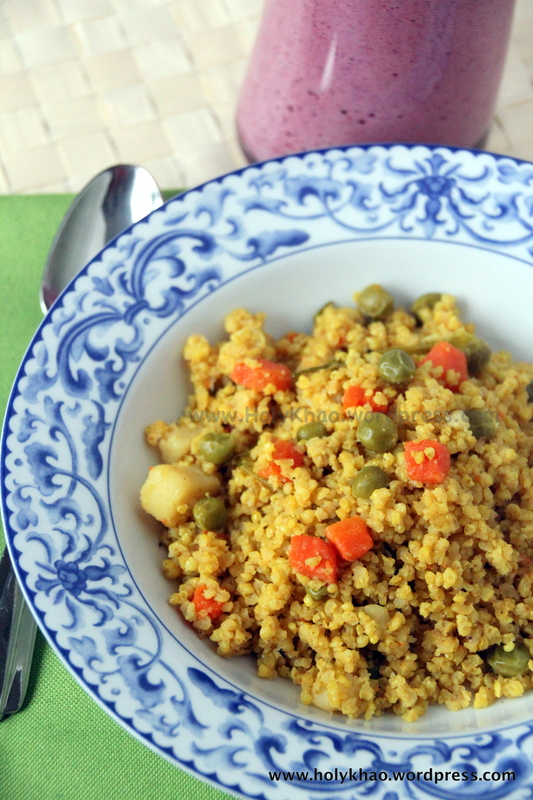 EASY method: Season directly in a pressure cooker pan, roast the vegetables for only 2 minutes, add water and millet, and cover. Cook on medium flame for 2 whistles. 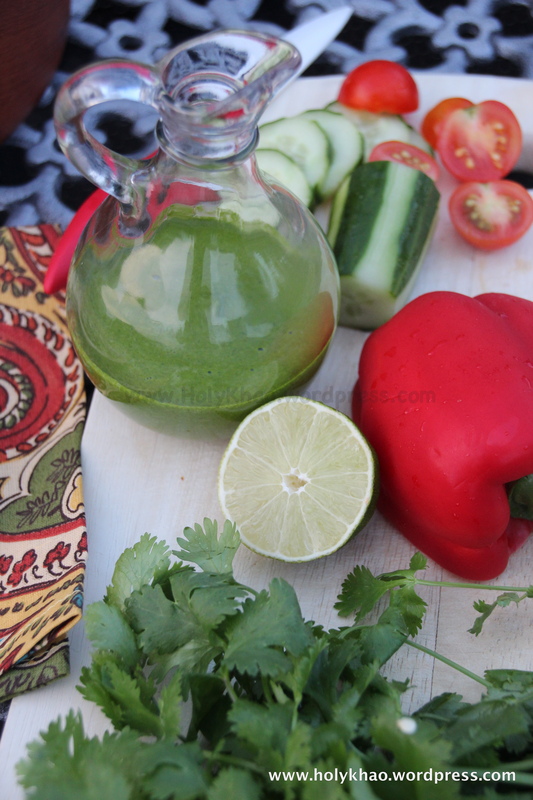 Allow to rest for about 15 minutes before opening and adding cilantro & lime juice. ***** Hulled millet is still a whole grain which is ‘shelled’ / just the bran removed – a realistic way of humans being able to consume it. Pearled millet is more processed and polished to make cooking times lower. Would you believe me if I told you that you guys are always on my mind? Really!! Summer was extremely busy and I just haven’t gotten back on track with a more diciplined routine yet. I must say though that I’ve lined up a ton of interesting recipes to share with you. I’m always thinking of HolyKhao readers and all the posts I should have made but haven’t. I know the saying ‘Actions speak louder than words’, but in my case, I implore you to put that aside and apply “It’s the thought that counts‘ :)). Nucchina Unde is a traditional Karnataka food that is made by steaming seasoned dal, and can be eaten plain, with chutney or a yogurt curry. 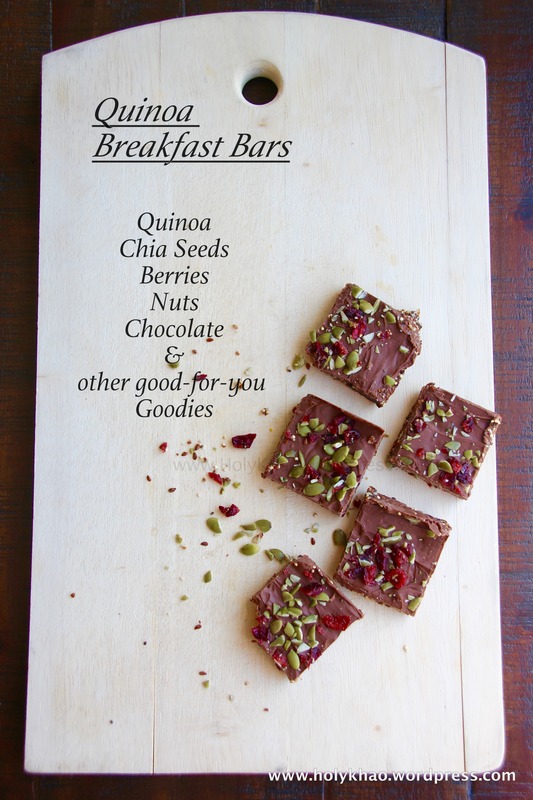 My aunt had mentioned that her friend had made this version with oats, but I was skeptical. Since she swore that it was delicious, I figured I’d give it a try. Let me just say that I was not disappointed! 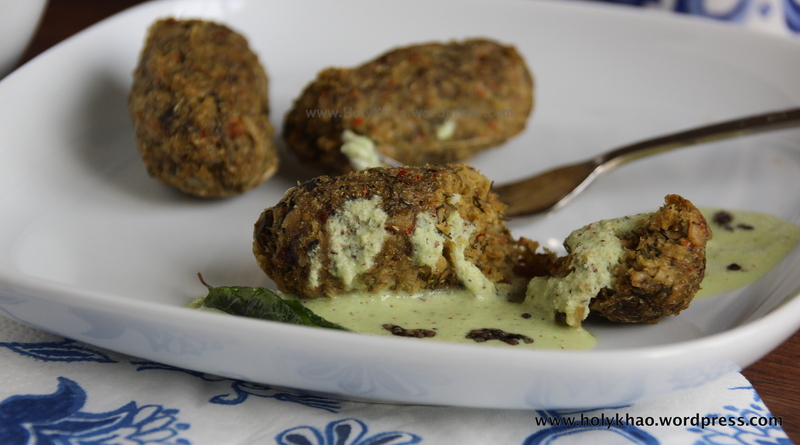 The patties tasted almost like the authentic dal ones, and were easier to make as it requires no soaking. I’ve made it thrice for recipe testing, and it has been a great breakfast and tea time snack, and my 11-year old has wolfed down quite a few. 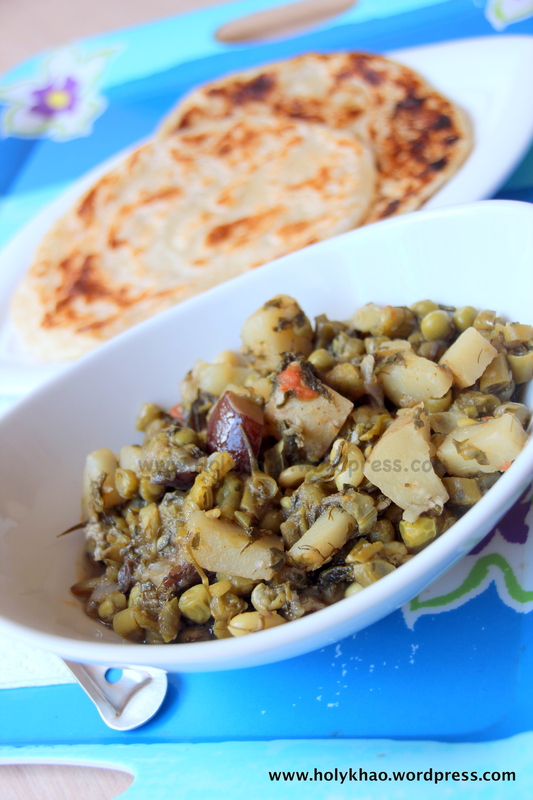 I grew up eating these plain with a generous dollop of homemade ghee, and it was only after I got married that I learnt that typically, nucchina unde is served with a yogurt & vegetable curry called Majjige Huli or Paladya. My version here is quick, no-cook, flavor-filled and small enough for this batch. Coarsely pulse the oats in a blender / food processor jar. 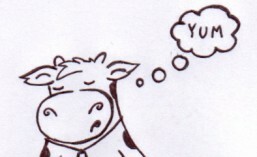 It should not be fine, and it’s okay to have some whole oat flakes. Add the maida & rice flour and mix well. Set aside. Add the masala, dill, salt & lime juice to the oats and gently mix well. Set aside for 15 minutes to soak up the moisture and flavors. Take rounded tablespoons full of oats mixture and gently roll into 2-inch logs (Do not press too hard or the patties will be very dense). Place on a greased steamer plate / idli stand and steam for 13-15 minutes. Make a fine paste of the coconut, ginger, cilantro, chillies, channa, mustard seeds and a few teaspoons of yogurt in a small blender jar. Add the rest of the yogurt and give it a quick blend to incorporate everything. Remove to a serving bowl and add salt. Heat a small pan on medium flame and add oil. Add the mustard seeds and cover till it stops sputtering. Add the hing & curry leaves and cover partially, shaking the pan to crisp the curry leaves. Remove from heat and pour over the sauce. How many of you spent the summer with kids who were constantly eating – because they were starving after hours at the pool, because their friends were over and wanted a snack, they wanted to try a new concoction, or they were just plain bored because you took away their electronics? My kids had more than their fill of junk food over the last few months, and there was not much I could do about it when extended family visiting for a few months and there was constant entertaining. Fast forward to mid-August: the guests leave and my college bound child – who is suddenly on a gym routine – announces that he needs lots more protein than he gets at home! The 11-year old on a growth spurt eats like there’s no tomorrow. Husband says he’d like to take something from home to keep the 3p.m. vending machine run at bay. I just want something that can be eaten without utensils and feels like a treat but is also healthy for my family. 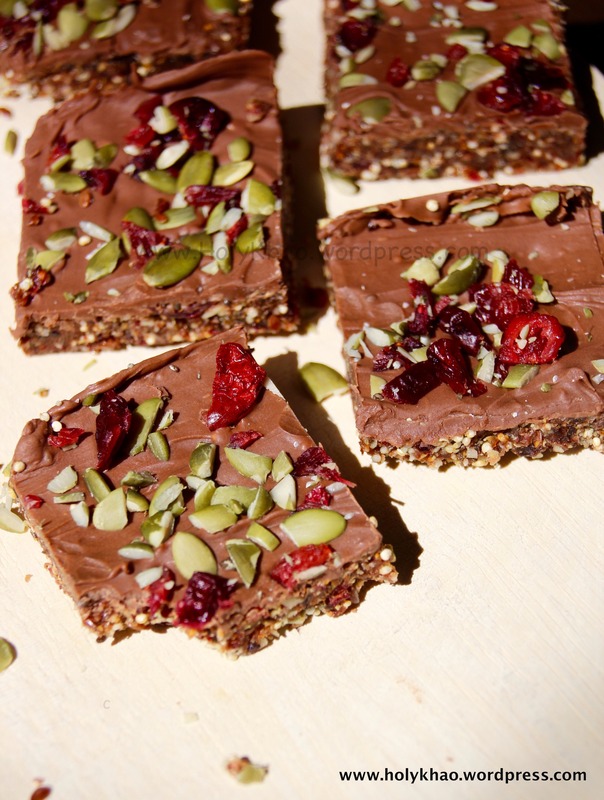 These Quinoa Bars to the rescue! I made these the first time without any recipe, and you can do the same too. The amounts and ingredients below are just a guide (as are many of my other recipes). Feel free to substitute what you have on hand and adjust quantities to suit your taste. For example, add coconut flakes if you like the taste. Substitute almonds with walnuts (or mix a little of both!). Replace cranberries with cherries or even raisins if that’s what you have on hand. I’ve used a whole 15 oz bag of milk chocolate chips but you could reduce it or switch it up with dark / semi-sweet / white chocolate. With school back in session and after school events looming around the corner, breakfast and grab-and-go snacks that are easy, tasty and good for you are a blessing. These bars keeps for a couple of weeks in the refrigerator. In a heavy bottom pan, lightly toast the quinoa over medium flame for few minutes. It will pop and lightly puff. Remove from heat & cool completely. (Do not brown.) – I feel this removes the slight bitter taste, but feel free to use raw if that’s what you prefer. In a heavy duty food processor, add the dates, figs and coconut oil and pulse till it becomes finely processed. Add the cooled quinoa, flax, chia, almonds and half of the cranberries & pumpkin seeds. Pulse until all the ingredients are finely chopped and mixed well. Line an 8X8 pan with wax paper and press the mixture into the pan. Level the top using the back of a flat spoon or dish. Melt chocolate chips according to package directions and pour evenly over the mixture and spread. Set in the refrigerator for an hour or so to set and firm up. Cut into 16 pieces. The bars keep for atleast 2 weeks in the refrigerator. This is a family friendly recipe that we’ve enjoyed for many years. 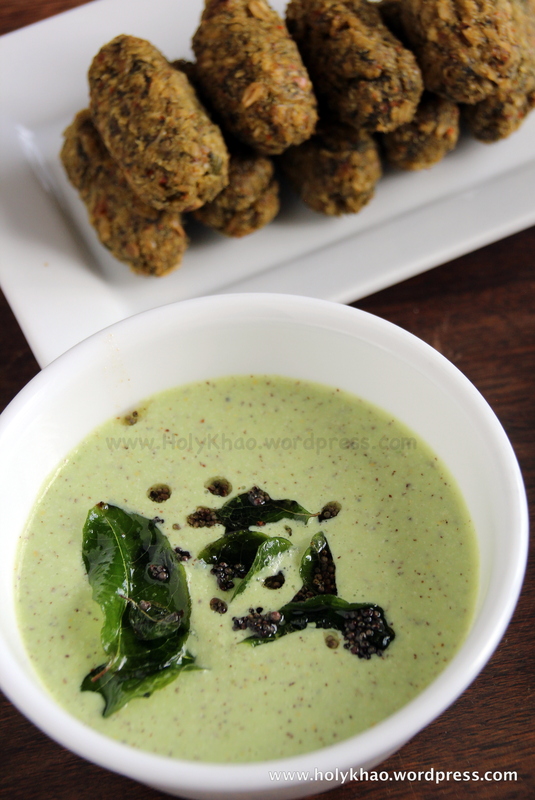 Quick, easy & nutritious, it was given to me by my friend Akhila. We did some measuring of ingredients over lunch and some girl talk last week – it’s good to have girlfriends who’ll cook for you and let you vent all afternoon :). Thanks Akhila. In a wide heavy bottom pan, heat oil over medium-high flame and add the cinnamon & cloves. Saute for a few seconds. Add onions and fry till just starting to brown. Add tomatoes and cook till soft – about 2-3 minutes. Add green beans and saute for 2 minutes. Add the potatoes & lima beans and saute for another 2 minutes. Add eggplant, chilli powder & salt and continue cooking for an additional 2 minutes. Mix in the spinach & dill, add water sparingly and cook covered till all the vegetables are done. 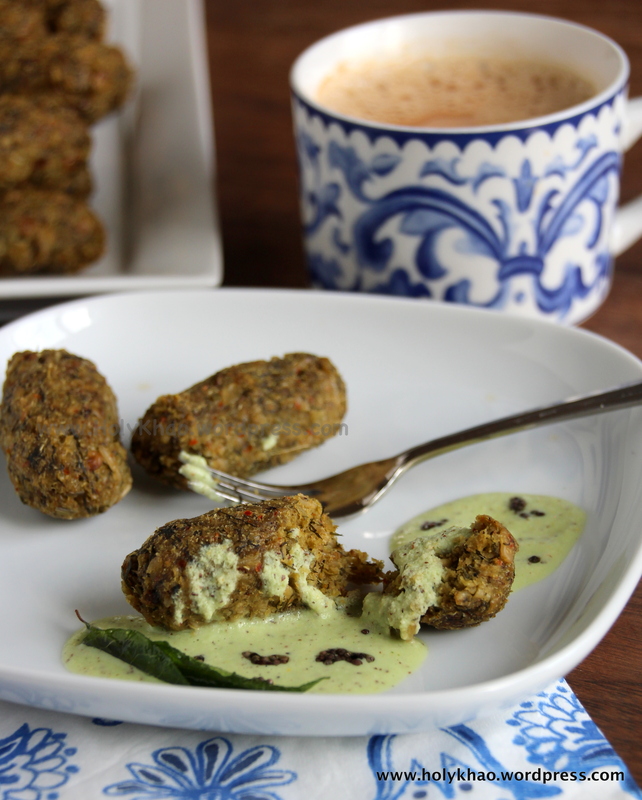 Serve with rice or flatbread like naan / roti / chapatis. Follow steps 1-3 as above. Add all the vegetables, salt & chilli powder and fry for 2-3 minutes. Add the spinach & dill, and 1/2 cup water and mix well. Cover pressure cooker lid and cook on medium for just 1 whistle. For someone who loves to drown their salad with ranch dressing and cannot stand vinaigrettes, finding a recipe for a thicker dressing that wasn’t too tart/sweet/unhealthy has been a challenge. Playing around with ingredients a few days ago, I finally made something that was fresh, packs a bite and is full of fresh healthy whole ingredients. Serve with Naan Pizzas (recipe here) for al fresco dining on summer nights. The dressing is really simple to make. Blend all ingredients in a small blender jar and adjust taste to liking, adding more oil by the tbsp if dressing is too thick. 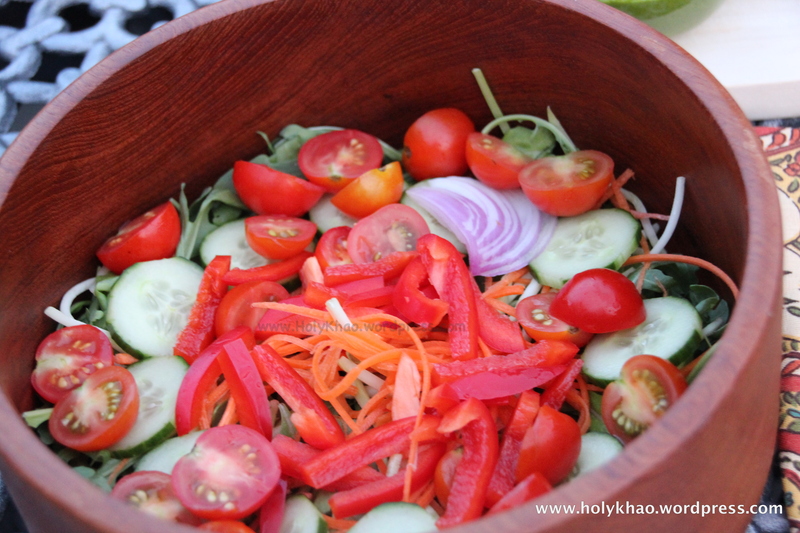 The salad shown in the photo has arugula, red onion, tomato, cucumber, carrots & red pepper. Use any combination of veggies and protein – top with chickpeas, tofu, paneer, grilled chicken, red meat, etc. 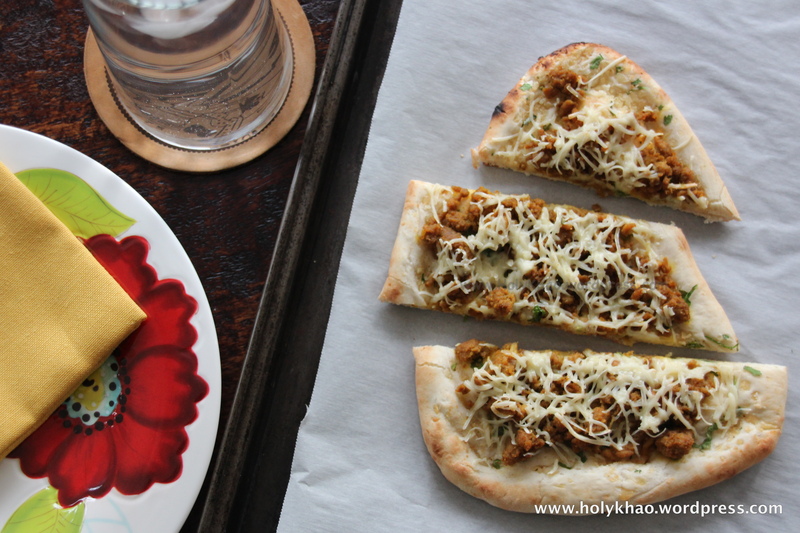 Naan Pizza recipes have been around for a while & I’m joining the bandwagon. If only I had known how easy this meal would be. I had dinner on the table in under 30 minutes, and it was really delicious! I’m all for convenience and used store bought naan but you make it from scratch if you like. (You can try this Naan recipe here with over 1500 reviews!!) As for toppings, our pizzas show ground turkey but you can use any protein of your choice – tandoori / rotisserie chicken, shrimp, paneer, tofu or even just veggies like mushrooms, broccoli, tomatoes, onions, etc. The recipe below is more of a guide and can be customized as you like. My kids preferred a plain base, but you can start by spreading a spoon of pizza sauce, green chutney, etc before topping with meat, veggies and cheese. 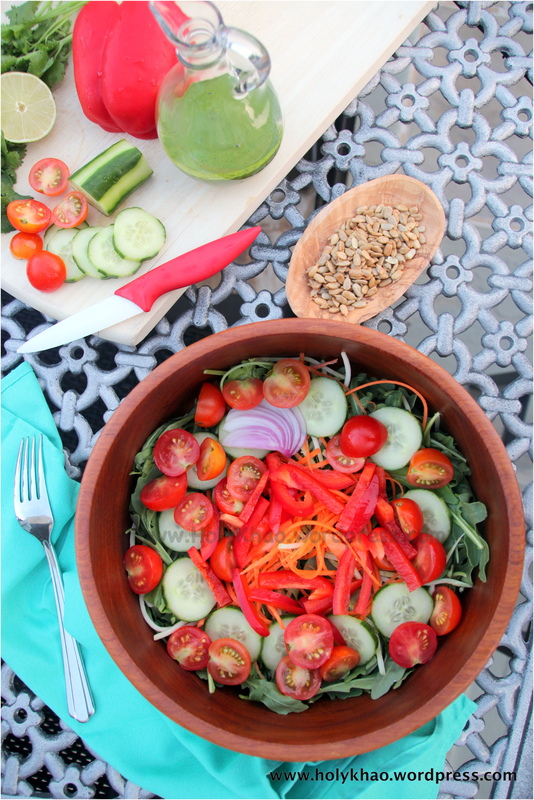 Serve a fresh salad with Cilantro-Lime Dressing to make an easy and tasty summer meal. Click here for recipe. 1) Heat oil in a wide pan on medium flame. 3) Add the ground protein and mix well with the spices. Continue cooking on medium-high heat, stirring frequently to break up lumps and ensure even cooking. 4) Cook about 10 minutes and adjust salt. Top with lemon juice. Remove from heat and set aside. 2) Lay naans on a baking sheet and top with 1 tsp of sauce or chutney of choice. 3) Spread a 1/4 of the topping mixture on the naan and spread evenly. Top with sliced onions if desired. 4) Now top with 1/4 cup cheese and place in the oven for about 3-4 minutes till cheese is melted. 5) If you want a crunchy crust (delicious! ), remove the pizza from the baking sheet and gently slide directly onto the oven rack; cook for another 2-3 minutes. 6) Carefully slide onto serving plate and top with fresh chopped cilantro before serving.